Very pretty Lefton birds wall plaque still in its original box! 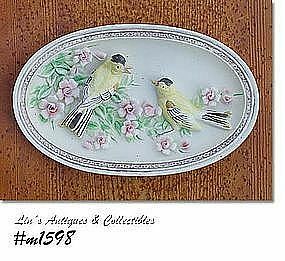 Measures 8 ¼” long, 5 1/8” wide and is white with 2 gold finches and lots of very detailed applied rose buds. Has a bisque type finish. Doesn’t appear to have ever been used – the hang wire isn’t even unfolded – has Lefton red and gold foil/paper sticker. Nice. Beautiful Lefton holly leaves with berries item! 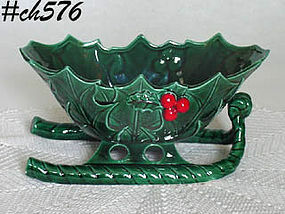 It is sleigh shaped and although box states it's a planter, it would be lovely used as a candy dish. 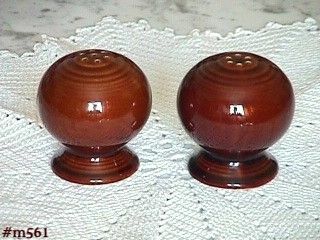 Measures 8 3/8" long, 3 3/4" wide, 4 1/4" tall (at tallest). 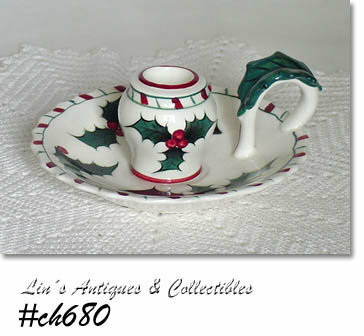 Item is in wonderful condition -- the rim edge (at back of sleigh) has a 1/16" glaze rub and the end of one runner has a 1/16" glaze ding -- teeny, tiny and neither are of any consequence. This is a super item, very colorful with lots of detail! 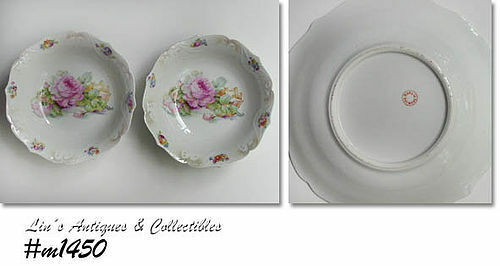 This listing has a very pretty serving bowl made by Buffalo China! 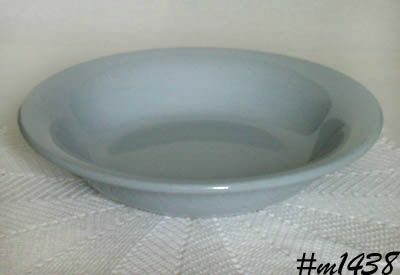 Bowl is a light blue/gray color, measures 2 1/4" tall, 10 1/4" diameter. Bowl is in very good condition -- it has minor utensil marks and there are 2 smooth glaze dings on inside bottom. 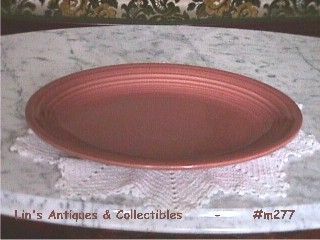 This listing has a beautiful decorative display plate! Back is stamped: Imperial Service Plates by Salem China Co, Made in USA, 23 Karat Gold. Plate measures 10 1/2" diameter. Outer 1 3/4" is green with very pretty gold decoration. 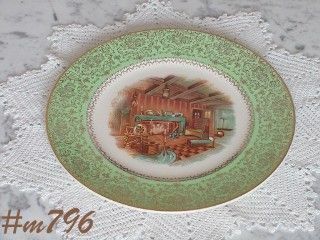 Center of plate has a very detailed colonial hearth scene -- rocking chair, spinning wheel, settle, baby cradle, etc. Beautiful plate, beautiful wall hanging/display! Thank you for visiting Lin's Antiques at Cyberatic! 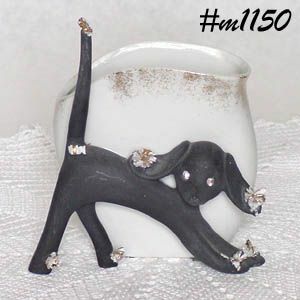 This listing has a somewhat difficult to find vintage Lefton item -- it's a spagehtti dog wall pocket. It is also free standing but would probably be safer displayed as a wall pocket. The planter portion is white with gold color "sponged" around top 1/2" of planter. Planter measures 4" tall, 4" wide. 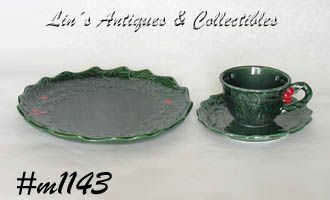 This listing has beautiful Lefton Green Holly items! There is a plate, a saucer, and a cup. Plate and saucer have the original Lefton paper labels. Plate is stamped 1970/71, 6018. 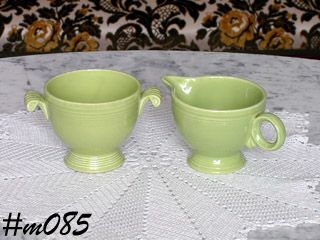 Cup and saucer are stamped 1970/71, 6017.